Nowadays most of the women want to do something on their own. The purpose is to earn some money and get involved in some productive works. Those don’t have a corporate job or don’t work in any firm, preferred to start some kinds of business at home or in the nearby shopping complex. A woman, who needs to look after her family, can start some kind of home based business. One good idea is starting a tailoring shop or a boutique at home. In this post, I will show you how to start a home based tailoring business. Let’s see the market opportunity for starting tailoring business at home. The apparel market is filled with the readymade garments. You will find a very few man who wears customized shirt and pant. They don’t need a tailoring shop. Women segment is the main market for the tailoring shop. Women love wearing customized and fitted clothes. They buy a lot of readymade garments from a mall or a bazaar. But they need someone to alter the brand new cloth. So they often visit to tailor for alteration or custom fit clothing. Some of the common ladies clothing products include Kurta, suits, salwar, and kameez. Even garments purchased from the local market must be restitched to avoid seam failure. In festival season many women prefer wearing a saree and designer blouse. When they buy saree, they need one blouse too. Normally they get a blouse piece with the saree. Again they need a good tailor who can make their blouse custom fit and custom designed. They need to attach fall to the saree and need to finish both ends of the saree, to stop fraying out of yarns. In every society and colonies, there is a demand of good tailors. Let me share more interesting opportunity areas. Nowadays in metros and big cities, people are shifting to flats in societies. In such a big society a number of families are living, are enough to start tailoring shop business. Even though some tailors are already providing tailoring services in your locality, you can start yours. Remember, women always look for better tailoring services. This business is ideal for housewives and female who want to earn while running their family. How much floor space is required for a home based tailoring shop? Though it depends on number machines and staff, a 100-120 square feet space is enough to start with 2 machines. You can also utilize the vertical space for storing materials. 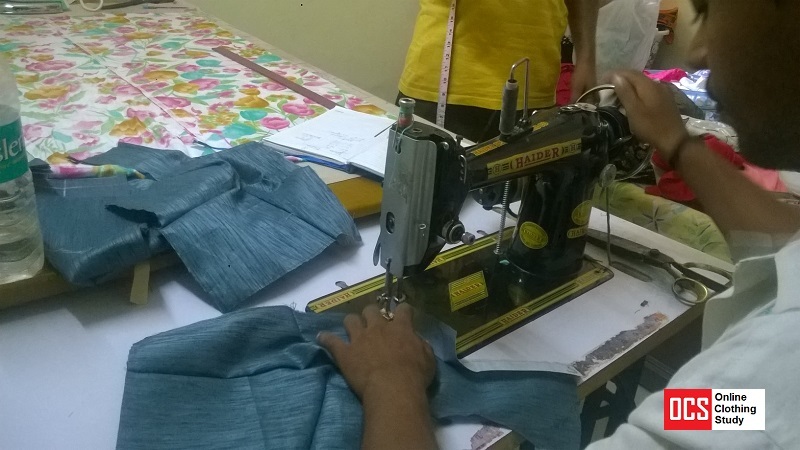 Take training on tailoring and garment manufacturing and pattern making. A 3-6 months course is enough to start tailoring shop. Note: You don’t need to learn stitching work if you get stitching done by a hired tailor. What kind of machines do you need? For a tailoring shop, you need at least one black head single needle lock stitch machines and one 3 thread overlock machine (Also called as interlock machine). An interlocking machine is used for edge finish. If you want you can invest in industrial sewing machines too. The price of the black head sewing machine in Amazon store is around Rupees 3500 -6000/-. How to do marketing of your services? You need to tell others about your services. For this print flex banners and display it in the main gate of your house. Wherever possible put your banner ads so that people can see that you exist. If you are living in a society, you can print distribute printed bills/pamphlet door to door. You can market your services on your Facebook page. Also, create a Whatsapp group and send message time to time if you are giving any offer or have some products to sell. Other than sewing machines and a table, you need to purchase working aids. Refer to the following list. At the start set up your boutique with the minimum number of machines (2 machines) and equipment. If you are setting up your workshop at home separate the working space for the machine, working table and store. Purchase some inventory of lining fabrics and accessories. Most cases you need to attach matching lining in the garment. Do marketing as much as possible. Print some pamphlet and distribute in your society. Talk about your services when you meet with other ladies in your society. Open Facebook page and display designs time to time and discount prices. Print flex banners and display the banner wherever possible. One banner must be placed at the main gate of your shop/house. Print your mobile/phone number. Contact 2-3 good tailors for stitching on a contract basis. Have 2-3 alternate tailors on hand. Call one of them in your workshop when you get work in hand. The hired tailor can come and work for 2-3 hours in a day to complete the work. Or you can call them alternative days or once in a week depending on the work. When you will get regular work you call them daily. Hire a girl or a lady for help on manual works like button and hook attaching, hand stitching etc. Try to give best services to your customers. Always take care of the customer satisfaction. Remember, your customers will become your invisible sales force. If you do a good job, the satisfied customer will bring more work to you and tell others about your good services. Print one price list of different types of work and hang on the wall at the visible location. I have visited some boutiques in the locality where I am living. Following are few rates for your reference (Delhi and NCR). Note: The rate for different types of work may vary place to place. Always think about expanding your business. When you see your work volume has increased and you can’t deliver all order on time – it is time to purchase one more machine. If you feel you have the decent number of customers you can start selling readymade clothes like kurta, suit pieces, leggings and ladies innerwear products etc. Though there would not be many sales of these products, you can have some earning. If you are good at designing, develop some good samples for suits and blouse and put those on display. You can expand your business in customized clothing and designer clothing. Wish you all the best on your new journey. Hope you might like this post. Share this post for business idea and guides with your friends. I have listed some items related to your work. You can purchase these from online store like Amazon. How to start boutique at home? The ideas and guides are explained in this article in a simple way. A list is provided for machine and equipment requirement for setting up tailoring shop.